A mock Ballot paper I was polled with today in Dublin South West. The lady who called worked for an agency so she didn’t know who the poll was for. It wasn’t the Greens anyhow as their candidate wasn’t listed. Age, gender, attitudes to the EU, How the EU handled Greece, who I voted for in 2011 and if things were getting better were other questions asked. 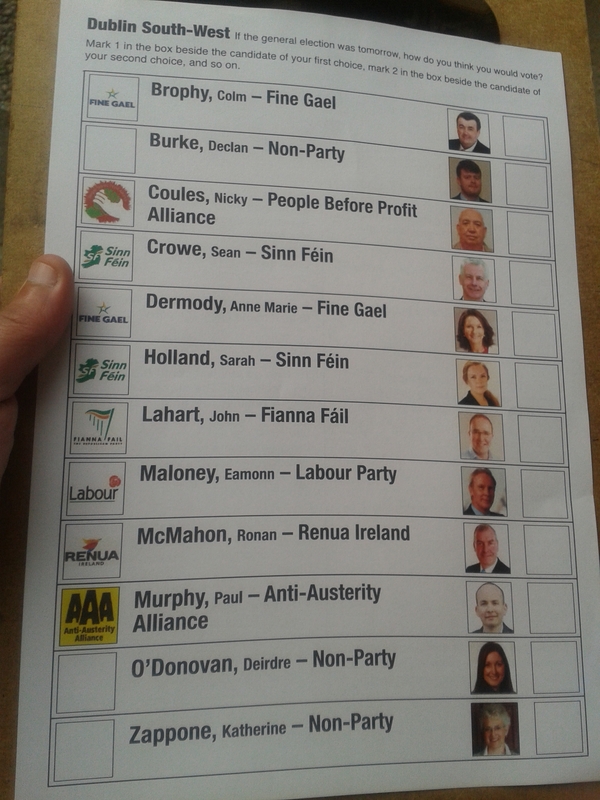 No Dermot Looney on the ballot paper? How about filling in the oul docket to get a bit of an arguement going? I’ll make a start – 1 CROWE 2 Holland 3 Burke 4 Coules 5 Murphy 6 O’Donovan and then a plague on all your houses! As someone unfamiliar with the non-party candidates (save Zappone), I’m curious as to what your preferences for them are based on? Roddy, you are displaying a worrying lack of discipline there. You should not fill out the ballot paper until the party tells you who to give your one two to. Vote management you know. Seriously though, SF must be in with a decent chance of two seats in DSW with that lineup of candidates. Obviously entirely speculative, but I’m guessing SF commissioned the poll, going by the questions; I just doubt the government parties are self-aware enough to query their stance on Greece (though it’d be interesting if they had, and indicative of substantial disquietive feedback for them). Joe,i’m giving Crowe the no 1 for persevering when there was no chance of a seat.”Oul hands” tend to vote for the “oul hands” ,knowing that the”young cutties” will be around for a long time and will get their chance and probably sooner than later.Sarah would even be leadership material in 30 years time when “the beard” steps down!